Moonlover (right) has added to her value as a future broodmare with a black-type win at Geelong. 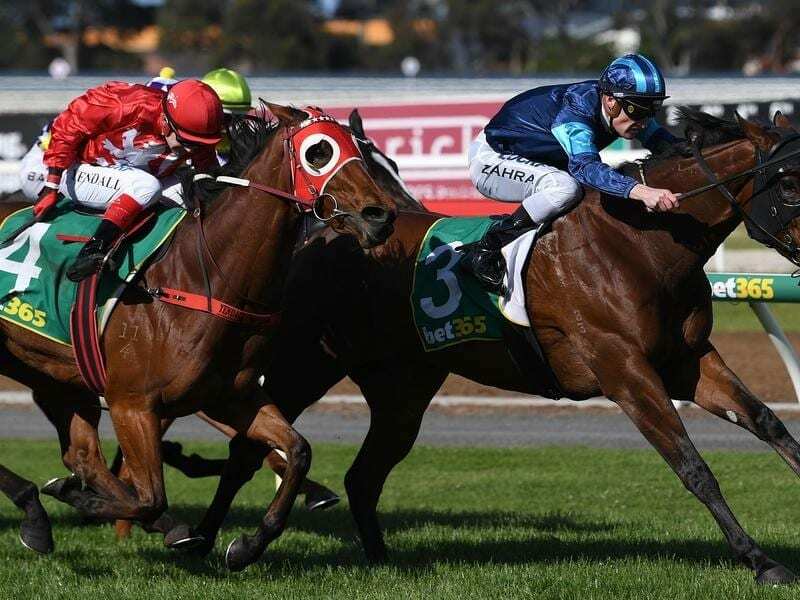 Trainer Matt Laurie has achieved an objective with five-year-old mare Moonlover who has raced to an all-the-way victory in a Listed race at Geelong. The half-neck win under jockey Mark Zahra in Wednesday’s Shojun Concrete Stakes (1200m) for fillies and mares was Moonlover’s ninth career victory from 34 starts. But importantly it was her first win at stakes level. “He rated her perfectly in front and full credit to Moonlover,” Laurie said. “She’s been up for a hell of a long time now and she just keeps fronting up every day. “And she’s got a stakes win, so that was the aim. Happy days. “It’s all about picking up black type and she had won eight races before today so she was going to be lining up in these sorts of races. Moonlover’s win formed part of a winning treble on the Geelong Cup program for Zahra, who also won on Royal Order and Harbour Grey. Meanwhile, jockey John Allen was suspended for eight meetings for careless riding in the second race of the day aboard unplaced Diamond Diva. His ban is due to start after Saturday’s Cox Plate meeting where he will ride Kings Will Dream in the feature and he will miss Victoria Derby day the following Saturday.